Who doesn’t like a casserole that is not only quick to assemble but it freezes well too? I don’t know anyone who would say no to this recipe. When planning meals for our family, I find that if I can make double and freeze one, then on nights when life is busy we can just pull something from the freezer. It’s a win-win!! 2 pkgs stove top stuffing mix (I use chicken flavor) you can also use pre-seasoned stuffing mix. Mix together soups w/ 2 cans water. Add the French fried onions, frozen peas, and chicken and mix thoroughly. Spray casserole dish with veg spray and pour mixture in dish. 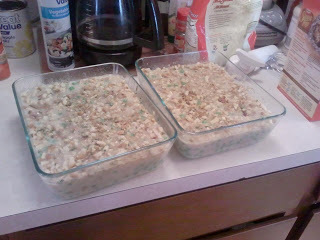 Top with stuffing mix and press into the stuffing into the liquid, cover and freeze. To reheat…..Thaw in refrigerator then bake covered w/ Foil at 350 degrees for about 45 mins-1 hour. Till everything is all bubbly and chicken is cooked through.